The Catholic University of America, founded in 1887, went 33 years without an official school song. In 1920, John Joseph Relihan, along with other students in the senior class, held a competition for an official alma mater song. The prize money was donated by Msgr. George A. Dougherty. A board of three faculty members awarded first prize to Robert H. Mahoney. "Mr. Mahoney's song was awarded the decision in the Alma Mater Song Competition conducted last semester by the Senior Academic Class and will be the official Alma Mater Song of [T]he Catholic University. The prize awarded by the class consists of fifty dollars. An excellent musical score has been written for the song by Mr. Victor Herbert, the well-known composer, and was magnanimously donated by him." A 1957 article in The Tower relates: "Mr. Relihan had contacted Mr. Herbert, then at the height of his fame, because he had always enjoyed his music, and because, after reading of his staunch devotion to Ireland, his birthplace, concluded the composer was Catholic. Mr. Herbert wondered if the fact that he was not a Catholic would matter." Relihan assured him in a letter that this would not be a problem. It seems that both texts were sent to Victor Herbert even though Mahoney's had already been chosen as the first prize winner, and Herbert agreed that it was the better text. Some mystery surrounds what happened next. The second-place winner, Thomas J. McLean (who was studying at the Sulpician Monastery), wrote his own music to the lyrics he had submitted for the contest. Not long after the competition, his piece, "Guardian of Truth," was being performed as CUA's alma mater song and is still used today although it's reserved largely for special occasions. The only two references we found to the change in songs referred to the idea that the CUA Glee Club simply found "Guardian of Truth" to be more suitable for men's voices. In Relihan's own account, he writes, "I have always liked Victor Herbert's music and liked his contribution to the university, but it was pitched high for men's voices and did not take hold. Father McLean's song was within the range of men's voices, did take hold, and unofficially became our Alma Mater Song." This line was echoed in the aforementioned Tower article. Oddly, the range of the Herbert piece is no higher than the McLean song. A Tower article of 1935 mentions our having two alma mater songs—the Herbert and the McLean—but by 1939 only the McLean is mentioned. The Glee Club was formed in 1920—about the same time the contest results were announced—by German language professor Leo A. Behrendt. At that time there was little music on campus, and the Glee Club became wildly popular, performing every Sunday evening of the school year in McMahon Hall. It began touring and frequently broadcast over three radio stations—first nationally and later internationally. 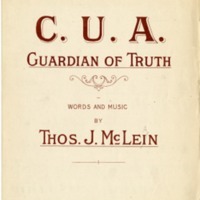 For more than 30 years, Behrendt and the Glee Club performed McLean's "Guardian of Truth," until Behrendt retired from directing the Glee Club just before his death. Small wonder that everyone came to think of "Guardian of Truth" as our official song. Every generation or so there is a flurry of activity at Catholic University when the Victor Herbert piece emerges and is touted as somewhat of a lost gem. The piece was recalled in a 1935 Tower article, as well as in later articles with such headlines as "Have We Rediscovered CU's Real Alma Mater?" (1954);"Strains of Alma Mater Are Nearing Extinction" (1957); and "The Lost CU Alma Mater" (1960). A brief history of the two songs and an interview with the lyricist, Mahoney, appeared in the 1974 Envoy, the predecessor to CUA Magazine. The discussion about the songs has never completely left the campus consciousness. In 1954, there was a push on campus to familiarize the students with the Herbert piece; it was performed at Homecoming and numerous other events. In a feature called "Candid Card," random students were interviewed about a campus issue. On one occasion the question of the week was "Why do you think that CU should adopt the Victor Herbert alma mater?" Junior George Rieber responded: "Gee, Dad, sounds wild! Seriously it's been so long since CU has had something that could arouse school spirit, and in my book this song can help to do just that." [ADD FOOTNOTE] Another article in The Tower from 1954 states that "Noted campus musical authorities acclaim Victor Herbert's piece to be of far greater merit and charm, melodically and lyrically speaking." Monsignor Donald J. Reagan — "Alma Mater" (1976): Not much is known about the reason this song was written. In the mid 1970's, professor and then wind ensemble director Dr. Robert Garofalo asked Reagan to arrange Guardian of Truth for winds. In a letter accompanying the score and parts, Reagan apologizes for what he considered to be flaws in his arrangement, blaming a lack of time which prevented him from doing the job to his full satisfaction. Included with the letter, without mention, was a copy of this song. It lacks words and most likely never had any. Leo A. Behrendt and Frances Fitch — "Alma Mater Song of The Catholic University School of Nursing Education" (ca. 1943) This was unearthed just in time for the nursing school's 75th anniversary. It was composed by Behrendt, founder and conductor of the original Glee Club. Fitch, a nursing student, wrote the lyrics. Some of the text in this page is taken from the article "A Mighty Something Which Is Ours" in the Winter 2011 issue of CUA Magazine, written by Rachel Barham and Maurice Saylor. Often misspelled Daugherty in The Tower and subsequent sources. Msgr. George A. Dougherty was the Vice-Rector of the University at the time. "Strains of Alma Mater Are Nearing Extinction," The Tower, November 1, 1957,1: "The lyrics of Mr. Mahoney's were set to music by Mr. Herbert, but, although very good listening, was a little too highly pitched for men's voices and never really caught on." "Music of the Tower," The Tower, November 14, 1935, 2: "Victor Herbert's 'Alma Mater' as a chorus could admirably be used at any C.U. Homecoming activity." Just a quick note to thank you for the book. I cannotget [sic] to it right away, but will look forward to doing it justice this summer. Congratulations ! I completed the Alma mater [sic]. I am not happy with the inner voices - the parts are most unrewarding. But I cannot afford any more time right now. Let me know if you think it is satisfactory. I am sorry that I do not have the time to make you a decent score. I hope you can work with what I am sending. My mother is in the hospital - had a slight heart attack. We are going to Rome for my newphew's [sic] diaconite ordination onApril [sic] 17, so she won't be able to travel with us. She is more than resigned to the fact. She is grateful it did not happen on the plane. Best wishes, and love to Ann and the children. Again, I apologize for the imcompleteness [sic] of the work, and the poor lines - if you want anything redone, when I have time this summer, I will be glad to do it.